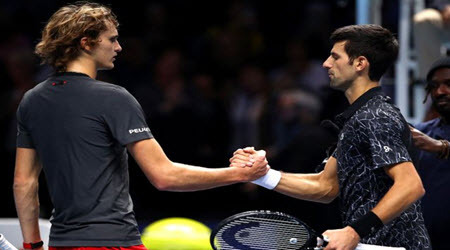 After 12 months of self-discovery, tennis sensational, Novak Djokovic, stopped to reflect on the most incredible of comebacks, even after his straight-sets defeat against Alexander Zverev at the ATP World Tour Finals. The setback obviously hurt, and Djokovic was processing that. However, the disappointment also included half-smiles as memories played back of how he managed to climb from 22nd to the number 1 position in the world in a space of 5 months which included two incredible Grand Slams as well. The lowest point in Djokovic’s career is extremely difficult to pinpoint. However, from Wimbledon in 2016 to this year’s edition, Djokovic went on a much-needed journey of self-discovery, patching his aching body back into one piece where he also rediscovered his love for tennis. Both fatherhood and age will do that to you, as well as a trip to the mountains and some perspective. After his Roland Garros quarterfinal exit, Djokovic decided to run for the hills. He managed to climb the Mount Sainte-Victoire ridge situated on the south of France along with Jelena by his side. During his climb, he had the time to reflect on previous years experiences, such as the lowest ranking in the world in 12 years, difficulties with his personal life, coaching challenges, and unforeseen injuries. This allowed him to refocus his energy and drive for life as the best tennis players in the world. There has to be something special in that mountain ridge located in France. It inspired Pablo Picasso to buy a property north of the mountain and provided inspiration to the work of Paul Cezanne. 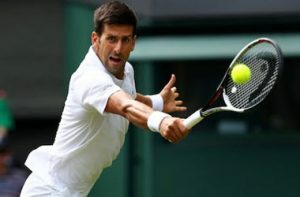 It also managed to spark a new flame for Djokovic, allowing him to refocus his abilities, triggering the beginning of a sensational few months that came to an end in London on Sunday. Djokovic managed to miss the second half of 2017, starting 2018 with a heart-breaking fourth round loss during the Australian Open along with an elbow surgery. “I was well aware that it was going to be a difficult season as I never had surgery before. Regardless of the outcome, I knew I was going to learn a great deal this season”, Djokovic stated. Djokovic managed to lose during the first round in both Miami and Indian Wells, event he previously dominated. Then he was defeated by Martin Klizan in Barcelona during the Round of 32 in April who was ranked in 140th position. Djokovic clearly had enough after the upset and managed to reunite with Marian Vajda which was the first time, we saw Djokovic make an astonishing return to the sport. Over the months that followed, Djokovic scooped up US Open and Wimbledon titles and became the first tennis player to successfully secure all 9 Masters 1000 series titles after his win at the Cincinnati Masters. He created a 22-match winning streak which eventually earned him the number 1 position in the world. Djokovic is ready to continue his success in 2019 and feels motivated to take on the world. Novak Djokovic, the world number one also became the first male player to reach the ATP semi-finals after a clinical win. His win over Alexander Zverev. After an extremely close and physical first set, the German had to accept that the Serb beaten him 6-4 6-1. After chasing the chance to play in the ATP Finals since as far back as 2015, Djokovic reached it after John Isner was beaten by Marin Cilic, he had to admit that it wasn’t exactly a breath-taking match, yet it was a win. Novak Djokovic felt he played well through the second set and served well during the start and second set, while he also recognises that his opponent did make several unforced errors, which counted in his favour and assisted him to achieve a win. It was Zverev’s double fault that basically handed the win to Djokovic in the first set and looking back at the match a total of thirty-three unforced errors is what hugely contributed to the downfall of the 21-year-old. Novak Djokovic is by far the favourite to claim his sixth title by winning the seasons tournament, and he had a remarkable year, this includes him recovering from elbow surgery and then to go on to win the US Open and Wimbledon, while also returning to the top rankings after two years. The Association of Tennis Professionals, currently ranked Novak Djokovic as the number one in the world of singles tennis. His successes include thirty-two series titles in the ATP World Tour Masters 1000, fourteen Grand Slams, and he is known for holding the number one ATP spot for more than two-hundred weeks. With an emphasis on aggressive play, Djokovic is an all-court player, while his groundstrokes are penetrating, deep and consistent from both wings. His backhand is regarded as the best it has precision and great pace and then Djokovic is also a fantastic mover on the court with impressive court coverage, superior agility and major defensive ability, allowing him to continuously hit winners from what appears to be defensive positions. His extroverted personality makes him a favourite right through the world, and his fluency in numerous languages never fail to impress. The Novak Djokovic Foundation assists disadvantaged children to develop and grow up in safe and stimulating environments. The foundation was founded by Djokovic in 2007. It partnered in 2015 with the World Bank and promotes education to children in Serbia, and after Djokovic’s Australian Open he donated $20,000.00 to the early childhood education of disadvantaged children to Melbourne City. Wimbledon this year was one that made history. From the attendance of the royal family to the everlasting matches, the visits and great performances by tennis veterans, and the unpredictable outcomes of the matches. While there is still more tennis to be played by the professionals this year as the Grand Slam is scheduled to happen in the upcoming months, here are a few finishing lines that should be tied before moving onto the next event. What is Going to Become of Serena Williams? Why this question may seem ominous, it’s not like the tennis star is just going to go into hiding. If anything, ger grand comeback after spending a few months off of the courts for maternity reason had everyone in doubt if the tennis star would be able to reclaim her title. Though, her constant perforce at Wimbledon proved that she would and that she could. From her powerful serves that broke records and having fierce competition this year, Serena proved that all she needed was a belief that she could come out a winner and after a while, everyone watching started to believe in it as well. She expressed her glee when discussing what she thinks when people talk about her being their favourite player, this happens before Williams reminiscing about the time while she was pregnant and still playing, and winning, too. Despite losing this year’s final Wimbledon match, Serna is still confident that this was a great comeback and that she can only move forward in her career. Is Andy Murray Going to Return? Any Murray was looking towards having an exciting Wimbledon performance but sadly had to draw out of the tournament during the early hours before it began due to a bad hip injury. Although, since then the player has tested out his right hip in the best way he knows how – by playing two warm-up events. During his recovery, Murray decided to work as one of the commentators for BBC as it was the best thing to do instead of forcing a speedy recovery. Since Murray reached the quarterfinals of Wimbledon 2017. The player has only played in three other tournaments since then. At the end of the month, he plans of pulling a move similar to Serna and celebrate his comeback onto the court Washington, D.C., last one this month. Murray has stated that being on hard courts does feel more natural and stabilises him more. He admitted he feels more comfortable on them and from the looks of it – will begin to prefer playing on them to avoid any more serious injuries. 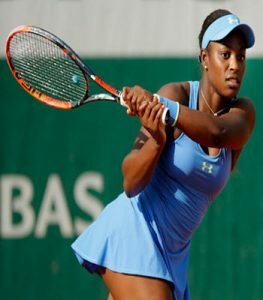 Sloane Stephens had a dramatic Wimbledon as the player collapsed during the opening round. This makes the 2018 Wimbledon the second one in a two-year period where the player was helped to the exit before the match truly began. Her health seemingly just like her career, has seen its fair share of up’s and downs in the last few years. At times, it seems as if the American player find ignite her passion to win and become a beast on the courts, while at other times she seems to fall short. Stephens has the potential to become a strong player, but she lacks the consistency that her fans and her critics are looking for. Though despite her nearly instant loss, she has shown to have a good spirit regarding it as it can be seen in her interviews. Despite having a quick scare at Wimbledon 2018, Serena Williams is going to confidently move to the semi-finals after an impressive victory over the skilled and graceful Italian player, Camila Giorgi. While the 23 times Grand Slam champion lost her cool, which also caused her to lose her first set. Williams came back strongly scoring of 3-6, then 6-3, and 6-4. While Williams world rank has dropped, Giorgi has steadily climbed halfway up the ladder to reach the 52nd spot. She is known for having powerful hits with her racket, a power that has been commonly seen by Williams during her career. Although, the American based player found an upper step which gained her the needed win. For online tennis betting sites, the changes in player ramkings has an impact in the odds set for upcoming matches, and for Serena, that will likely rise as she gets accustomed to playing again. This coming Thursday, Williams will be faced off against the 13th seed, the talented and skilled German player, Julia Gorges, in the first semi-finals match. After that, the open competition can range from another German seed who is 11th, Angelique Kerber – who impressively beat the Russian star, Daria Kasatkina with a 6-3 and 7-5 score, the 12th seed who is the Latvian player Jelena Ostapenko who beat Dominika Cibulkova with a 7-5 and 6-4 score. Serena Williams is one of the most prominent American women’s tennis players around. Although despite her fame, when her opponent was asked about how she felt about playing against such a house name, Giorgi simply responded that she does not follow women’s tennis. While her reaction may have raised a few brows in the audience, she playing skills proved that she meant what she said. She played with an incredible amount of skill which was increased with her nonchalant attitude towards Williams. During the match, Giorgi played similarly to how Williams would, especially power wise. She skillfully gifted Williams three aces which also went towards her impressive 84% of points. While watching Giorgi was a show, seeing the recently returned player scramble and lose her footing during the first half of the match was something that not many expected. While Giorgi’s average serving speed was higher than Williams, the American player did have the highest recorded speed in the match reaching 122mph. Despite the rough start, Williams quickly gained her focus back as he roared “come on” to her opponent while blocking her from gaining more points. During the third set, Williams won with a backhanded screw. Although, it was truly Giorgi fitting the net which aided in Williams overall victory in the match. Does Williams have a chance of winning another Wimbledon Title? The answer may be in the grey area. While her sister Venus Williams did not make it, she was recorded with having the highest serve speed in the entire game of 123mph. Which was followed by Serena’s serve of 122mph during her last match. After returning to playing competitively in women’s single, which was followed after the birth of her daughter in March, she showed her dedication to the sport despite dropping in the world rank and stumbling during the first set of her last match. Her match against Giorgi proved that Williams still had the strength and stamina required to beat the top seed players. During an interview, Williams gleefully stated that she still feels good, and regarding her match with the Italian player, she stated that she did better than usual as she had to. 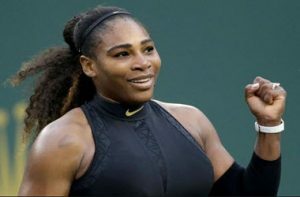 While Williams has already stated that she feels as if she doesn’t have to win this, she is still putting her all into making sure she gets as far as she possibly can in the game. Even though she is already going down in history, she is the lowest-ranked player to reach the women’s semi-finals at Wimbledon. Stan Wawrinka time at the French Open came to a close after being defeated by Novak Djokovic. Wawrinka, who is still building strength after back surgery and ranked low in the world lost to Djokovic in straight sets. 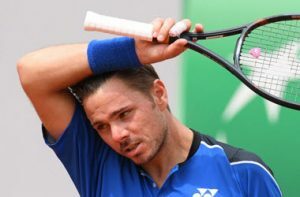 After being out of competition for the last three months due to a knee injury, Wawrinka had only participated in tournaments twice in almost a year. He has played only eleven matches this year. Wawrinka, who is ranked 30th and seeded 23rd for the tournament, is playing in territory that he is not familiar after climbing the ranks since joining the tour in 2008. The match on Monday lasted over 3 hours. The physicality of that was a strain for Wawrinka was obvious as he had yet to go five sets since facing and beating Andy Murray a year ago. The Swiss player is known for having one of the best backhands in tennis. Wawrinka is once again now being coached by Magnus Norman. The match saw Wawrinka with thirty-five unforced errors and only winning 12. Djokovic has previously held the top ranking with the World Tennis Tour but is now listed in 22nd, the worse he has held since 2006. Djokovic moved on to face Brazil’s Rogerio Dutra Silva beating the Brazilian in three sets after dropping two games during the opening set. After successfully winning the French Open in 2016, Djokovic was the first male player to win four major titles in a row. However, since that accomplishment, he has failed to add any achievements to his career after sustaining several injuries, one to his right elbow that required surgery. Tournament play at the French Open continues through to the 10th of June. With recent rain and several matches having to be cancelled, it is expected that additional matches will be re-scheduled. Djokovic will next play on June 1st when he faces Roberto Bautista-Agut. The history of Wimbledon is a rich one, and it is one of the four Majors. It is also the most prestigious of the Majors, and it is formally referred to as The Championships, Wimbledon. The first Wimbledon was back in 1887, and it takes its name from its location of Wimbledon, which is a suburb of London. The tournament is played at the All England Club, is the only major played on grass courts, and takes place from the end of June to mid-July. The All England Lawn Tennis and Croquet Club is the full name of where Wimbledon takes place, and it was established in 1868. In 1875, they added lawn tennis to the activities and at this time held the Lawn Tennis Championship which is now known as the Wimbledon Championship. In the first tournament, rules were laid out for the event, and it was held at Worple Road in Wimbledon. The rules of the tournament have not changed much, but some that have included the height of the net, and the distance from the service line to the net. For the first Wimbledon tournament, there was only the Gentlemen’s singles with Spencer Gore being the first champion. The ticket to the inaugural even was a shilling, and 200 people were in attendance for the finals. The main court at Wimbledon is referred to a Centre Court since it is in the centre of the All England Club. In the first Wimbledon, there were 22 players competing for the title and these days there are 128 in both the men’s and women’s singles. In 1884 ladies’ singles and men’s doubles were added to the tournament and in 1934 the ladies’ doubles and mixed doubles were added. One of the main rule changes to the tournament occurred in 1922, as previous to that year the defending champion automatically made it to the finals where they would face the challenger, who had advanced through the draw. This is why early on in the tournament’s history there are many that won consecutive titles. After 1922 byes into the finals for the defending champion was eliminated and that champion was in the main draw just like every other player. 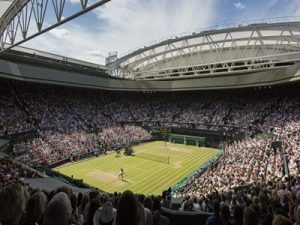 Wimbledon is not only the most prestigious tennis tournament in the world but one of the biggest sporting events in Britain. The British had a long drought for the Men’s title, as no British person had won the event since 1936 until Andy Murray won in 2013. No British woman has won the tournament since Virginia Wade won in 1977. British Royalty attends the tournament every year, and they have their own Royal Box at Centre Court. One of the things Wimbledon is well known for is the strawberries and cream served at the tournament and in 2017 34,000 kg of strawberries, and 10,000 litres of cream were served. As of 2018, Roger Federer holds the record for the most men’s singles titles with eight and Martina Navratilova holds the record for the most women’s singles titles with nine. Tennis aficionados can gear up for a busy 2018 since there are several events that are scheduled to take place around the world according to ATP World Tour elites. These events will be held in several different venues across the globe, and therefore you can choose which one to attend depending on interest and location in which you are. Here are the major events we will see in 2018. The lovers of tennis will open the year with this big event going down in Doha Qatar. The event has previously been worn by the big names you have heard in 2017 and past years including Roger Federer, Rafael Nadal, Andy Murray, and Novak Djokovic. In 2018, Novak Djokovic will be the defending champion having won back to back in 2016 and also in 2017. The total financial commitment that has been made for the 2018 Qatar ATP tour is $1,386,665, and the winner will take home $ 1,286,675. All the matches will be on the hard surface. The date to save will be 6th January 2018. Therefore, turn up and cheer your biggest fan as the giants in world tennis face off each other. Netherlands will for the third time in the history of ABN AMRO WTT host the event. The country has the honour of being the first host of the event when it was first started in 1974. The second time they hosted the event was in 1995, and this 2018 will be the third time they host the faceoffs. This is a trophy that has been worn by Roger Federer, Yevgeny Kafelnikov Andy Murray and Lleyton Hewitt. The main draw has not been held yet and is due to be held on 12-18th of February 2018. This will be held on March 21-April 01-2018, and the total financial commitment is $8,909,960 with the winner taking home $7,972,535. It will be hard surface as it has always been and will feature top men and women. This event has always attracted thousands of fans and players from the world, and it has always the place to be. The defending champion is Roger Federer who accomplished the Sunshine Double in Miami in 2017. This is the biggest clay surface event that will take place on May 6th, 2018. For those who don’t know, this was a hard surface event until 2009 when it was transitioned to a clay surface event staged by Caja Magica. Since the event was unveiled in 2002, the Spaniards have won the event five times with the last time being when Rafael Nadal lifted the trophy in 2014. This is an event that attracts even the real Madrid footballers, and the biggest fan is Cristiano Ronaldo, the striker. The total commitment for the 2018 edition is€7,190,930 and price will be €6,200, 860. These are some of the big tennis events to look forward to in 2018. Enjoy the matches.